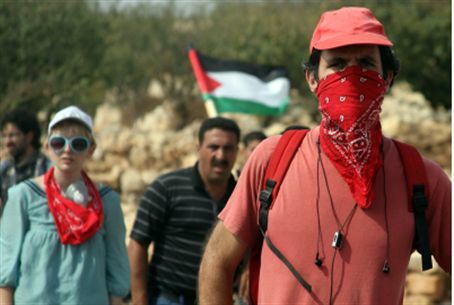 Jewish communities in the Hevron hills have faced regular leftist provocations for years. Anarchists often come to demonstrate on the Sabbath, bringing local Arabs with them. The breaking point came during the Sukkot holiday, when undercover police dressed as Arabs and approached the town of Susiya in an attempt to lure out local Jews suspected of violence against Arabs. “The people of Israel are sick of provocations by Arabs, the Israeli left, and international anarchists, who harass Jewish settlements in the Hevron hills,” said MK Aryeh Eldad (National Union), who took part in Friday’s demonstration. “The people of Israel are sick of the support the justice system gives to these provocations,” he added. The demonstration was organized by the Women in Green movement. Several other groups took part in the rally as well, among them the Binyamin Residents’ Committee, the Samaria Residents’ Committee, and the Komemiyut movement. Hevron is the ancient city where the Patriarch Abraham purchased land in order to bury his wife Sarah. The large plot was named The Cave of the Patriarchs (Me'arat Hamachpela) as it became the burial place of the three Jewish Patriarchs and three of the four Matriarchs. The midrash says that it was the burial place of Adam and Eve beforehand. The tribe of Judah lived in Hevron after the Jews entered the Promised Land, and King David was king there for seven years before being recognized as king of all of Israel and conquering Jerusalem. Jews lived in Hevron peacefully for centuries until 1929, when their Arab neighbors were incited by Jerusalem's Mufti to attack them. The brutal massacre of 67 defenseless Jewish men, women and children put an end to coexistence. The survivors left Hevron, where the indentations in the walls for mezuzahs can be seen to this day and where much of the property was theirs. The city was overrun by Jordan in 1948, but the IDF returned victoriously in 1967 and Jews - as well as other faiths - could visit the Cave of the Patriarchs once again en masse - and for many, it was the long-yearned for chance to live their lives in one of the four holy cities mentioned in the Talmud, the land of the Patriarch Abraham and King David.